Acquired from the above by the present owner in 1974. (K. McShine, 'Introduction', pp. 13-23, McShine (ed. ), Andy Warhol: A Retrospective, exh. cat., New York, 1989, pp. 20-21). (D. Bourdon, Warhol, New York, 1995, p. 250). Exploding from the canvas with the intense contrast between the bold thick intensity of red and the stark white of the background, Andy Warhol's monumental, six-foot-by-six-foot 1967 Self-Portrait is a highly important picture from a series of only eleven works, five of which are in museums. 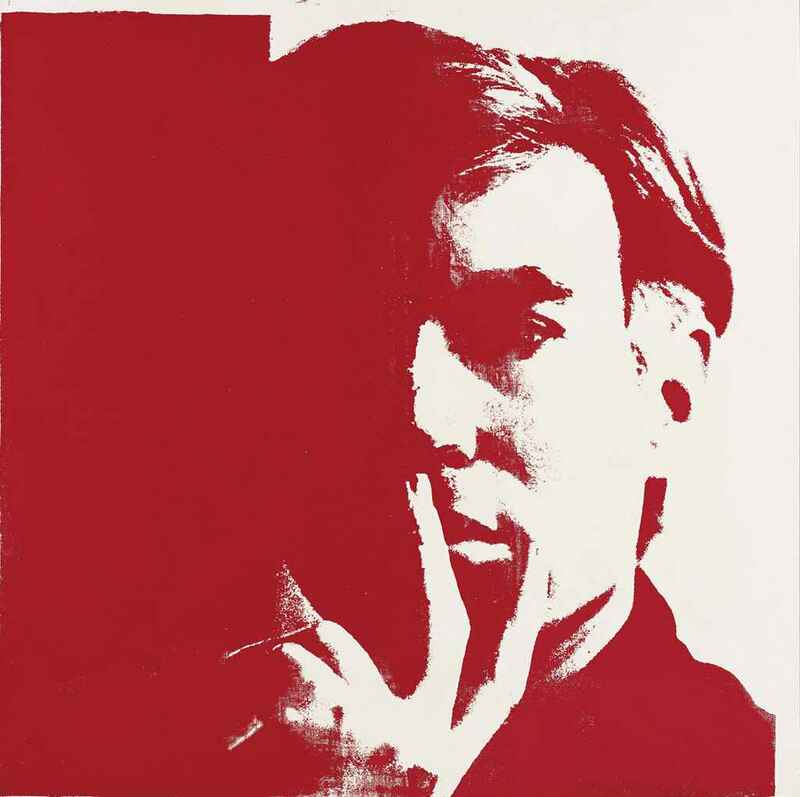 It shows one of the most celebrated of Warhol's images of himself, with his hand held to his mouth in a contemplative pose, at a time when his fame as a towering figure in the American art scene had reached a new peak, when he had achieved a position of dominance over a new generation of the avant-garde. This picture is all the more exciting as it is an historic rediscovery. It is not in the catalogue raisonné but has been approved by the Andy Warhol Art Authentication Board, and is an addition to the ten known self-portraits of this type and on this scale which was acquired from Warhol's dealer Leo Castelli in 1974. It is a mark of the incredibly important nature of this series that of those ten previously known large self-portraits, five are in museums: examples are held by Tate, London, The Staatsgalerie Moderne Kunst, Munich, the San Francisco Museum of Modern Art, and two by the Detroit Institute of Arts. As with many works of the time, the crisp, deliberately restrained palette of Self-Portrait thrusts the image into relief, heightening its abstract qualities, making the mass of red with the various intricacies that delineate Warhol's shadowed features and hands resemble the gestural paintings of, say, Franz Kline. This effect is accentuated by Warhol's thick application of red paint - the same colour which Warhol employed in many of these large-scale self-portraits - which articulates the luscious surface and lends it a substantial physical presence. Kynaston McShine included eight of Warhol's vast 1967 self-portraits in the 1989 retrospective dedicated to the artist which he curated, the first major review of the artist's work following his death two years earlier, reflecting their seminal position in his work. (T. Scherman & D. Dalton, Andy Warhol: His Controversial Life, Art and Colourful Times, London 2010, p. 377). The image of Warhol with his hand to his mouth used in Self-Portrait has been described in the catalogue raisonné of his works as, 'probably the most well-known of the three versions he produced during the 1960s and, with his self-portrait of 1986, one of the most representative and iconic images of the artist' (G. Frei and N. Printz (ed. ), The Andy Warhol Catalogue Raisonné, Paintings and Sculptures: 1964-1969, vol. 2B, London 2004, p. 227). While the source image for Self-Portrait has not been found, it is based on a photograph of which other copies are known. This was a posed picture, taken by a camera rather than in a photobooth, revealing his desire to completely style and compose the image. This source image was originally used in 1966 as the basis for a group of 22 inch square works. These essentially show the artist's face at life size; they were exhibited en masse at the retrospective of Warhol's work organised by Alan Solomon at the Institute of Contemporary Art in Boston that year. Warhol's appreciation of the image is clear from the fact that he also used it on an invitation to his innovative Cow Wallpaper and Silver Clouds exhibition at Leo Castelli's gallery in New York in April 1966. The presence of that portrait-format photograph also illustrates a crucial transformation in the 22 in. and six-foot silkscreen self-portraits: Warhol has played with the format of the picture, squaring it, cropping into his head, abandoning the traditional 'portrait' format. Instead, he has chosen the square. This concentrates the high contrast between the various tranches of paint in these images, pushing them further towards abstraction. Warhol's ability, and indeed desire, to project himself through his pictures means that his self-images form an intriguing arc that charts his meteoric rise and rise. This apotheosis was exemplified the following year when Warhol used the same source in a group of six foot square works, six of which were exhibited in the American Pavilion at the 1967 International and Universal Exposition held in Montreal, which was visited by tens of millions of people. The exhibition in Montreal was the American Painting Now show that formed part of Expo '67, and which was organised by Solomon, who had also curated the Warhol retrospective of 1966. Hanging alongside the likes of Jasper Johns, Roy Lichtenstein, Barnett Newman and Robert Rauschenberg, Warhol's massive self-portraits revealed his bravura. As recounted in Andy Warhol: His Controversial Life, Art and Colourful Times, the book recently co-written by Tony Scherman and Warhol's former studio assistant David Dalton, 'Although some of the paintings were bigger... Warhol's six canvases, scattered throughout the display, conveyed a sense of omnipresence - everywhere you looked, Andy looked back at you in an act of unabashed self-promotion' (T. Scherman & D. Dalton, Andy Warhol: His Controversial Life, Art and Colourful Times, London, 2010, p. 377). Self-Portrait and its fellows show the artist looking contemplative, yet because of their scale they are declarative. Their size and their square format recall the original Most Wanted Men, an appropriate reference given his own increasing notoriety. These vast pictures of Warhol peering out demand attention. The transformation carried out by the huge scale of Self-Portrait, which is now essentially human-sized rather than life-sized as had been the case with the earlier 22 inch heads, is made all the more vivid by its comparison with those smaller works, which are a mere fraction of the size; at the same time, as is clear in Self-Portrait, this new size heightens the abstract appearance of the composition. The monumental pictures such as Self-Portrait have also taken on a completely different character due to the sheer substantiality of their paint surface, which was in part a result of their size: because of the vast dimensions of these pictures, the paint appears thicker and more expressive in certain areas. This created a tactile effect that Warhol clearly appreciated and manipulated, a factor that adds to the abstract quality of Self-Portrait, with the amassed red creating a density that would prefigure his later more 'painterly' pictures such as the Mao works of 1971. Warhol's initial silkscreen self-portraits were created in 1963, the year after his trailblazing exhibition of Campbells Soup Cans at the Ferus Gallery in Los Angeles which had propelled the artist into the public arena. Those self-portraits showed Warhol huddled furtively in a photobooth, wearing a mackintosh and shades. This picture hinted at his own consciousness of his position as an artist, and a scandal-causing one at that, at the momentous beginning of his career; as yet, he was not the instantly recognisable, silver-haired personality that he would later become, but instead an underground figure known only to a small section of the art world. In his 1964 self-portraits, Warhol revealed the extent to which he was already on the ascendant: he was represented in a defiant pose, his head raised, almost snarling at the camera. The contrast was heightened, appearing in swathes of untrammelled colour, eschewing the overtly photographic appearance of his earlier series in favour of an almost short-hand style. In those works, his viewpoint made it appear that he was looking down at the viewer. Warhol's pose and the frontality of the image recalled the mugshots used as source images for his scandalous Most Wanted Men series, also of 1964. The original Most Wanted Men were large square pictures used on the outside of the New York State Pavilion at the World's Fair held in the city that year, which caused enough opposition that they were coated with metallic aluminium paint. The fact that Warhol had been in a position to decorate the exterior of the building, and the attention that his depictions of the FBI's thirteen most wanted men had brought to his work, made a huge impact. He was no longer the obscure artist of before, huddled in his trenchcoat, and this was reflected in the emphatic nature of his self-portraits from that year. Self-Portrait belongs to the third and most famous group of self-portraits from the 1960s, which showed him having risen yet higher in the book of fame, depicting himself as a serious artist, demanding attention as an intellectual who had become recognisable. During 1967 he also created a group of portraits of prominent artists of the day that included himself. In the late 1970s, the subject came to take on a new character. Selfportraiture clearly appealed to Warhol, partly because of his own fame and interaction with - and management of - the personality cult that had generated around him. Within a short time he had created a large number of new self-portrait types, for instance showing himself with a skull, often taking advantage of the then-endemic Polaroid camera that had become such a staple of his life and that allowed him to capture, in an instantly developed picture from a democratic, levelling lens, the flow of life at the centre of the maelstrom that was his life. Warhol's exploration of self-portraiture culminated in his iconic 'Fright Wig' self-portraits from 1986, which were to become epitaph-like images, appearing portent-like a year before his death. Showing himself with gaunt, skeletal features exaggerated by the stark flash, often depicted in disco-ish colours against a night-like background, those haunting images appear like emanations or after-images, ghostly tributes to the artist who himself appears presciently aware of the proximity of death. Warhol was still creating pictures, and was also exhibiting them, for instance in the one-man shows in Cologne, Paris and Hamburg dedicated to his Most Wanted Men, those declarations of Warhol as an artistic public enemy number one. Despite this, he claimed in 1966 that, 'I don't paint any more, I gave it up about a year ago and just do movies now,' a notion clearly disproved on a grandiose scale by Self-Portrait (Warhol, quoted in G. Berg, 'Andy Warhol: My True Story,' 1966, pp. 85-96, K. Goldsmith (ed. ), I'll Be Your Mirror: The Selected Andy Warhol Interviews: 1962-1987, New York 2004, p. 88). During that period, having founded his reputation on his pictures of soup cans and superstars, Warhol was becoming more interested in creating films, and it is in his movie-maker pose that he is shown in this picture, watching the world, sucking it in, as he did in his long-take films such as Sleep or Sunset. These were objective movies that chimed perfectly with his objective pictures of fragments of life and popular culture from the world around him, revelling in a similar cool detachment to that of Self-Portrait. Indeed, Warhol's pose in this picture resembles his gaze from behind his camera, as he stood there watching the world go by, either in the form of the drifting conversations and copulations of his friends or in his screen tests, where he trained the camera on a subject for minutes on end, watching them perhaps smoke a cigar, eat a banana or simply do nothing. Self-portraiture has long been a genre that artists have used in order to demand attention as a serious artist, displaying their credentials, and also to explore and express their own state of mind, a product of intense introspection as well as self-promotion. Warhol's Self-Portrait recalls Max Beckmann's iconic Self-Portrait with Tuxedo of 1927, showing himself in a serious intellectual pose to position himself within society. He was also doubtlessly influenced by the self-portraits of Rembrandt, one of the other great chroniclers of his own appearance who, like Warhol, created likenesses of himself that serve as milestones guiding the viewer through his life and career. The self-portraits of Rembrandt have a twilit, scumbled appearance that is echoed in the dominant shadow of Warhol's picture here, revealing the Pop artist tapping into a recognised imagery in order to turn it to his own purposes. Indeed, Warhol was looking at the entire history of self-portraiture, especially its increasing association with self-expression in the modern world. This was a development that is most perfectly encapsulated in the self-portraits of Vincent van Gogh: these have become canonical representations of the way that an artist can convey a state of mind, be it ecstatic or tormented, through the use of self-portraiture. Similarly the pictures of Norwegian artist Edvard Munch, for instance the celebrated painting showing him smoking, convey some sense of the haunted persona, a sense of psychology. The self-analysis that these artists pioneered would be a gauntlet taken up by other artists throughout the Twentieth Century who increasingly used depictions of themselves combined with expressionistic brushwork to convey their state of mind. Warhol, aware of these associations, knew that looking at Self-Portrait, any viewer would see it in the context of the frankness of other twentieth-century examples of the genre by such artists as Henri Matisse, Pablo Picasso or Francis Bacon. The shadowy Self-Portrait engages enthusiastically with the broody imagery of the genre, showing the artist demanding the respect due to his position in the avant garde. Yet Self-Portrait also reveals the iconoclastic and irreverent artist appropriating all this art history and twisting it to his own wry purposes. Warhol not only avoided but actively undermined all those ideas of self-expression and self-revelation espoused in the self-portrait in the Twentieth Century. This is clear in Self-Portrait: he has used the silkscreen process rather than the direct brush-and-canvas favoured by those other painters. While Self-Portrait has an appearance of self-examination, encapsulated in Warhol's pensive attitude, the stylisation, with most of his face lost in the coagulation of red that conveys the shadow, means that it teeters towards abstraction and manages, like the artist's own gaze, to remain inscrutable, limiting the amount of information conveyed. Warhol's self-portrait is the result of a process of removals: he has used a photographic image, perhaps taken by someone else or, if not, by a self-timer that functioned like a remote control. In contrast to the frank self-portrayals of his predecessors, Self-Portrait reveals Warhol deliberately occupying ambiguous territory, challenging the viewer to call him out: is he thoughtful or is he striking a pose? Through the playful processes of detachment and the extreme control with which he sanctioned and controlled his own public image as his fame grew, Warhol paradoxically managed to achieve the desire he explained to Gretchen Berg the previous year: despite being increasingly in the public eye, 'I'd prefer to remain a mystery, I never like to give my background, and anyway, I make it all up different every time I'm asked. It's not just that it's part of my image not to tell everything, it's just that I forget what I said the day before and I have to make it all up over again. I don't think I have an image, favourable or unfavourable' (Warhol, quoted in Berg, op. cit., 2004, p. 87). Self-Portrait, then, is a typically Warholian paradox. Its scale and the emphatic manner in which it has been created, with its richly-textured surface and the intense contrast between the white and the vivid red, show the artist declaring, in pictorial form, 'Here I am!' And at the same time, the mysterious pose and the high-contrast shot of his own face cloaked in red shadow that he has used as a source mean that he is still provocatively concealing his identity to some degree, asking, 'Who am I?' With the iconic intensity of its palette, Self-Portrait is an important addition to the group of large self-portraits from 1967, which themselves marked a point of culmination in the creation of the identity that the artist created for himself, creating his deadpan films, making his epigrammatic comments and presenting his viewers with a new, searing vision of the landscape of popular culture that surrounded them. Self-Portrait is thus one of the cornerstones of the architecture of the personality cult surrounding Warhol which remains such an incredible influence on the art world, and indeed the world in general, to this day.